Let us design your dream safari! Sleep under the African stars. This video by Stuart James Arnold introduces Hyena Pan Tented Camp's sky beds. For first time visitors of Botswana, these pages will give you information on the diversity of people and cultures who are proud to be called Batswana. Thank you for organizing such a wonderful holiday for my parents and I. Everthing went so well and was just what we needed. You should be proud of the attentive staff, service and lovely facilities in all those places. The attention to detail was amazing. We felt very spoilt. Thanks also for the champagne- it was a lovely touch. Liquid Giraffe provided us with an adventure that exceeded our high expectations and provided experiences that we will not forget. The itinerary developed in response to our brief was exactly what we wanted with an emphasis on good animal viewing and photographic opportunities. All camps were comfortable and clean with excellent guides, trackers and staff. 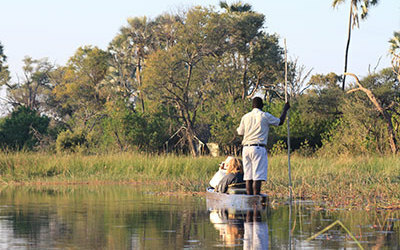 Just a quick note to thank you and the team for the excellent planning and execution of our trip to Botswana – it was stunning in all senses.. what an amazing country and what an excellent itinerary. We will be back for more.